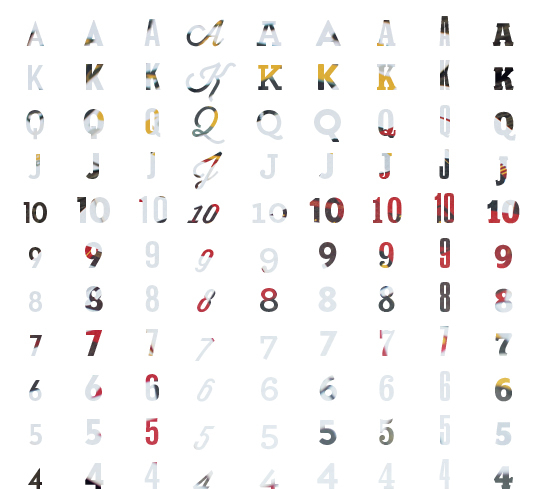 An entirely custom deck of playing cards as a "Thank You" to our clients. 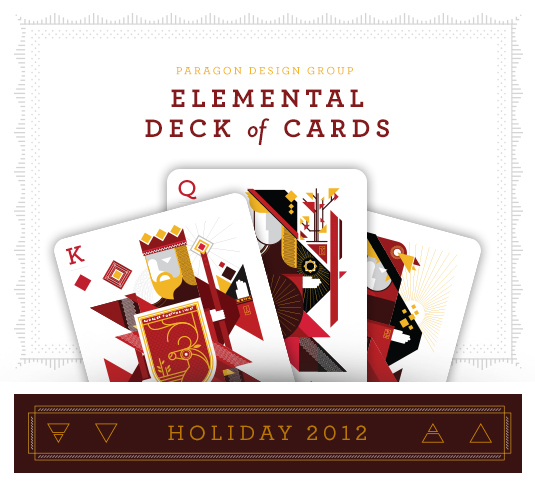 For Paragon’s annual holiday mailer we opted to design a collectible, entirely custom deck of playing cards as a “Thank You” to our clients. 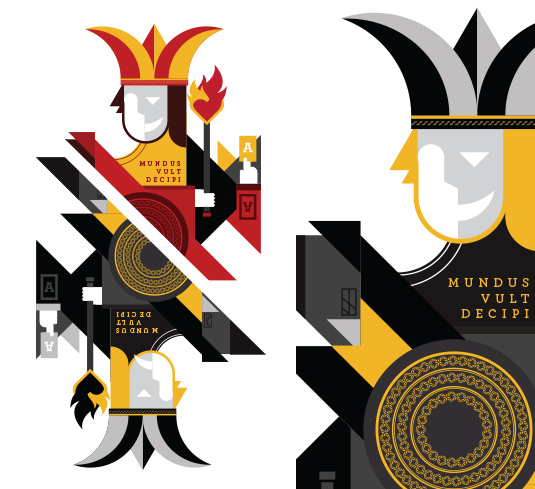 The four suits were designed to represent the four elements (earth, air, water, fire), and included traditional icons incorporated into the face cards as well as new embellishments like latin text and intricate symbols of the four elements. 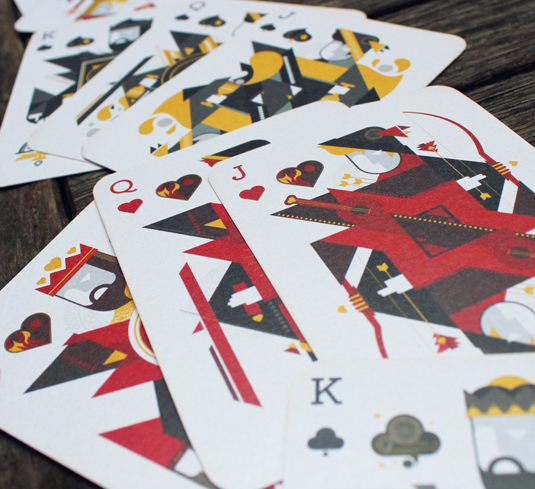 The backs of the cards featured a graphic pattern created using our logo mark. 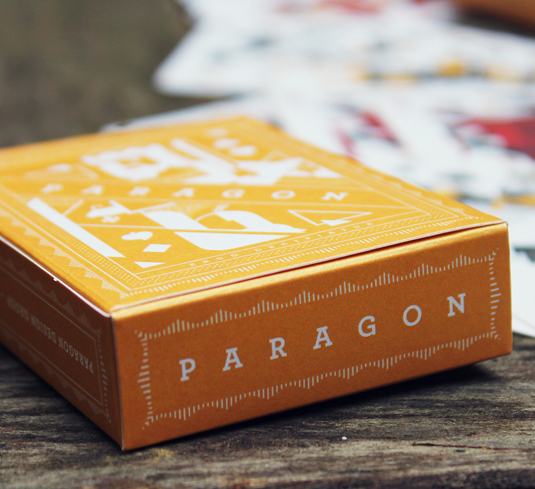 Both the deck and custom box were printed on Shine paper appropriate for the holiday season. The goal of this deck was to incorporate the symbolism and philosophies surrounding the Classical Greek Elements of Earth, Air, Fire and Water. 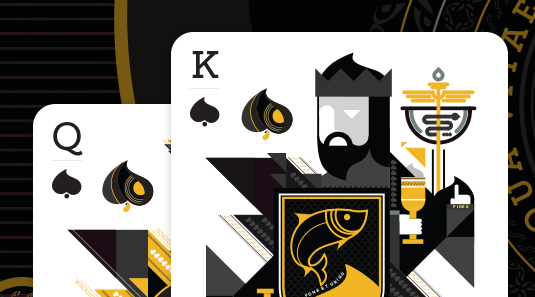 Once we began digging into the historical significance of each element we decided the only way to do it right was to allow each traditional kingdom (Hearts, Spades, Diamonds and Clubs) to represent the elements. 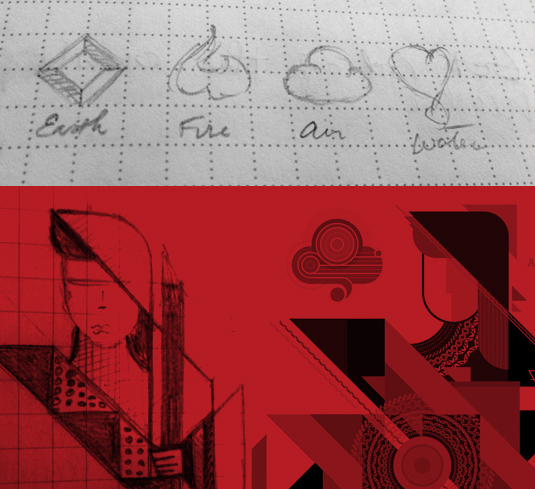 I began with sketches to update each of the traditional suits (Spades, Hearts, Clubs and Diamonds) so that they can represent the Classical Greek Elements (Water, Fire, Air/Wind and Earth). After establishing each of the kingdoms, I began working on how to create the royals. I love this Latin quote, and thought it would be fitting to represent both fire and hearts. It is from Roman Stoic philosopher and statesman, Seneca, and reads in full “ignis aurum probat, miseria fortes homines”, in English translation,”as gold is tempered by fire, so strong men are tempered by suffering”. The meaning is that in order to become pure gold, the original gold-bearing ore must go through the tempering process of fire; the analogy being that for a man strong in spirit, adversity and suffering are the tempering agents necessary to refine his character and bring out his true potential. This is the rich kingdom. The Lannisters, for those of you who watch Game of Thrones. They represent power and might at all costs. I think I actually like this suit the best, and had a great time designing each of the figures. The king features a symbolic animal of power and earth, the Stag, and the quote on his shield is “Audaces fortuna iuvat” (Fortune favors the bold). He is holding the traditional weapon of earth, the staff, and his sleeve features the latin word “Potentia” (Power). There are also three hidden symbols in this suit, which I will not discuss (I need to keep some secrets). The queen is holding the traditional offering of earth, which is the Pentacle (an amulet used in magical evocation). She also has a tree growing over her shoulder, since harvest and nature are supporting symbols for earth (reference the king’s shield again). The Rich Jack, he is holding the traditional tool of earth, which are coins. Correspondences: strength, stability and abundance. In rituals earth is represented by burying objects in the ground, carving images out of wood or stone, herbalism or using animal fur and bones. The manifestations of the earth element are found in plants, trees, mountains, forests, caves and gardens. The bear, boar, bull, sow and stag are also thought to personify the element as are all burrowing animals, such as the mole or rabbit. Correspondences: emotion, compassion, divination, intuition, healing, dreams and psychical abilities. The manifestations of the element of water are rivers, oceans, lakes, wells, rain, fog, ice, snow, streams and all drinks. Animals, especially the seal, dolphin, crab, turtle, frog and all types of fish are also thought to personify the element of water. Other mythic and legendary creatures of water include the Mermaid, Oread, Naiad and Sea Serpent. This is a common phrase in magic, but its origins and original meaning are what make it important to me. The philosophy of the Joker is that of self preservation, deception and self gain. The full quote is “Mundus vult decipi, ergo decipiatur” (the world wants to be deceived, so let it be deceived) is talking about religion as a tool to control others. According to the pontifex maximus: people should be deceived in religion, there are many truths which it is useless for the vulgar to know; and many falsities which it is fit the people should not suppose are falsities. Probably my favorite single card, the joker has a few fun adornments. His face is both smiling and frowning – to illustrate the duality of mischief (deception). He also has an ace up each sleeve. He is adorned in the symbols of all suits, because his nature is apparent in every philosophy. 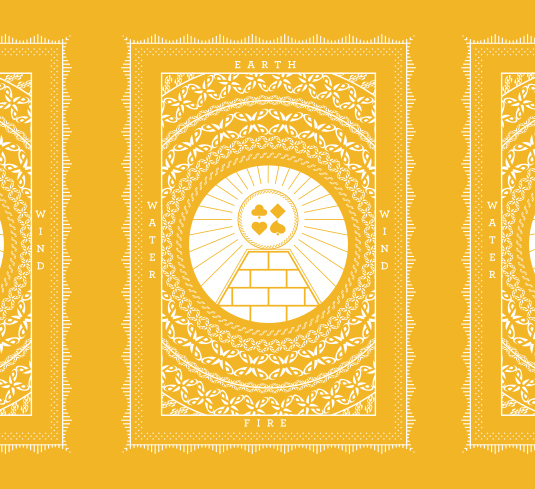 The back of the card features a an unfinished pyramid, a personal symbol that we must always be building and reaching upward to perfection. Along with a unique King and Queen, the box features the hidden alchemical symbols for each element on the closing flap. The queen is holding a flower, a symbol for peace, and the king is holding a sword, symbolizing war. 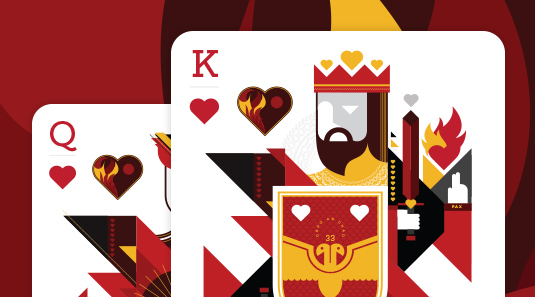 And for all of you asking if this deck is available for purchase you’re in luck! There are still some available for sale HERE. While he swears he won’t design for internet explorer and is unable to breathe without his iphone, James is generally an easy-going guy who can be convinced to do almost anything if there’ll be food involved.